I don't really know what to write, but want to write something. What happened on December 26th 2004 was something quite unimaginable, off the scale, almost impossible to believe (unless you were right there). 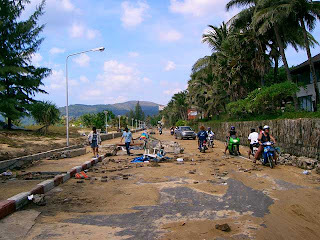 I did not see the tsunami, my family was safe at home, all we saw were the after effects, and most of what we saw was on the TV... even though you might think we were right here in the middle of it all here in Phuket! 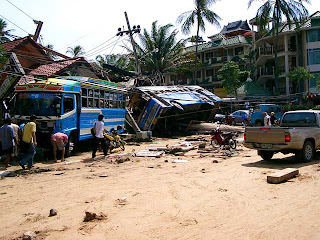 The photo above shows Kamala temple, at Kamala Beach Phuket as the tsunami hit. 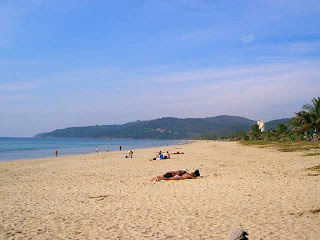 Kamala was one of the worst hit areas of Phuket. We'd been there on the 25th with friends, having a drink at the beach, kids playing around. My wife was 9 months pregnant... our son was born 11th January. A lot of "what if's" were in my head for a long while after the tsunami. When I see this photo it reminds me that we are very lucky. 4 years later I don't dwell on the "what might have happened", but am very happy to have my family. As I write this, my boy (nearly 4 now) and my girl, now age 7, are racing round the living room on their Christmas presents - a couple of scooters. It's well past their bed time, but for today, I don't want to tell them "Go to Bed!" - I am happy to watch them having fun. 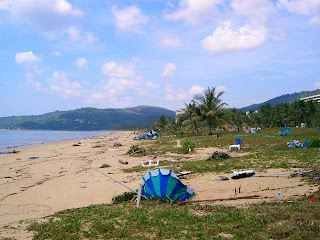 More photos of Karon and other beaches after the tsunami.. and you can get some idea of the rapid clean up here : Phuket after the tsunami. 4 years. A lot happens in 4 years. On December 31st 2004 we had no party, we lit some candles in the garden and a few tears were shed. I have to say it was a very very sad time. Replaced by happiness on January 11th 2005 when our son was born. At this time the future's so bright I gotta wear shades. Kids are still riding around the living room on scooters. Bless 'em. There have been some interesting stories in the news about the tsunami recently. One talks about coral regrowth in damaged areas.. another hints at tsunami recurrence times of about 600 years based on studies of soil layers in affected areas. I think this will be the last time I try to write anything about the tsunami. People keep asking about it. Today I have told the same story to customers several times. I don't want to be rude, but OK, it was 4 years ago now. Yes I was here. No I was not directly affected. We saw nothing really nasty. I did for a while feel guilty about being so close to it all, and yet not losing anything or anyone myself. Time now to get on with life. Just 2 weeks until my son's 4th birthday. And just a few days until New Year.. and we will party this year! Oh, a final note.. I saw just a few days ago, just before the 4th anniversary, that Oxfam had announced the end of it's tsunami relief program. There is a locally based charity still involved with long term relief, though they also have nothing now to do with "tsunami relief". I somehow feel attached to it, as the 4Kali charity was set up by the family of a girl called Kali who died on December 26th 2004. She and her family were originally booked by me on a dive trip, but had to cancel due to their son suffering a bad accident where he broke his neck. The family came to Thailand anyway for their holiday. The local director of the charity was a neighbour of ours too. Fear not for the future, weep not for the past. Bring on 2009.